Did you know that salmon is great for your HAIR? Besides being rich in protein and vitamin D (both are key to strong hair) the omega-3 fatty acids found in this tasty cold-water fish are the true superstar. Your body can’t make those fatty acids, which your body needs to grow hair. About 3% of the hair shaft is make up of these fatty acids. Omega-3s are also found in cell membranes in the skin of your scalp, and in the natural oils that keep your scalp and hair hydrated. Other options: If salmon doesn’t thrill you, you can also get essential fatty acids from fish like herring, sardines, trout, and mackerel, as well as avocado, pumpkin seeds, and walnuts. 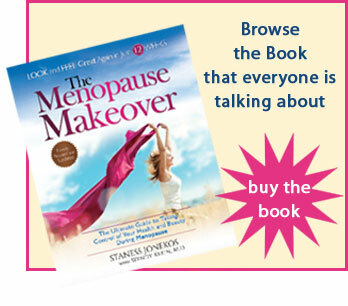 Enjoy this healthy, easy-to-make, Menopause Makeover approved meal! Prepare asparagus by washing and trimming 1″ off ends. Pre-heat oven to 350-375 °F (175-190 °C). Place salmon portions on broil pan and season with Montreal steak seasoning, extra virgin olive oil, paprika, parsley, wine and lemon juice. Also place asparagus stalks on pan, drizzle extra virgin olive oil on them and season with Montreal steak seasoning. Place in oven for about 7-10 minutes, or until salmon begins to flake.